Andrews Race Cars offer full computer aided design (CAD) facilities, from the smallest chassis tab to a full tube frame - we can help. 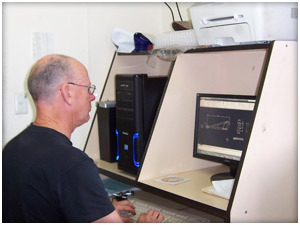 We can provide chassis plans to allow you to build your own car. Many of the cars in our gallery section have been built using this technology. We also offer four-link optimisation services for existing cars using the same technology. 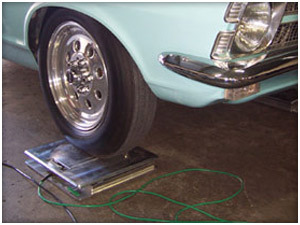 Andrews Race Cars offer electronic individual wheel scaling, taking the guess work out of race car set up. Our many successful customers are testament to these indispensable instruments. 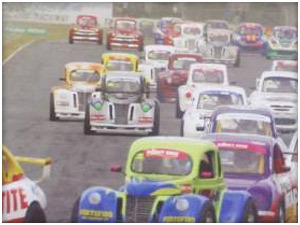 Since the inception of Aussie Racing Cars in 2001, ARC has been a subcontractor to Phil Ward's team, supplying all the cro-moly front suspension components manufactured in specialised jigs, also fabricated by ARC. We also supply the pedals for these cars, again manufactured in jigs fabricated by ARC. Andrews Race Cars offer full tube bending services in all materials, chrome moly, CDW and aluminium. Our tube bender is a 'draw over die' bender which produces almost perfect bends with very little distortion or thinning. The sizes we can bend are: 3/16", 1/4", 3/8", 10mm, 1/2", 5/8", 3/4", 7/8", 1", 1 1/8", 1 1/4", 1 3/8", 1 1/2", 1 5/8", 1 3/4". We have 2 different dies for 1 1/2" tubing, 1 for chrome moly and 1 to allow us to produce the tight radius bends in CDW tubing that is required for some circuit racing categories such as historic and some open wheelers. Andrews Race Cars have templates for over 100 popular production cars to enable us to provide kit roll cages. These templates are extremely accurate and each one was made to suit the individual body shape. They are not '1 size fits all' as provided by some competitors. The bar work when installed is extremely close to the confines of the body and in the right hands a finished product as good as produced in house can be achieved. The kits include all the required bent tubing plus all the straight tubing to complete the job. If bolt in intrusion bars are required we can provide the clevises and mounting tabs to suit ANDRA regulations, or approved clamps for CAMS roll cages. 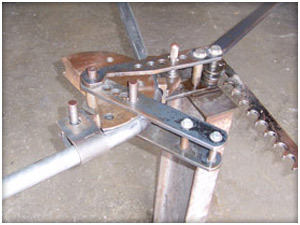 Tube notching is required and a high proficiency in welding is a must. All 4130N cages have to be TIG welded and it is highly recommended for CDW cages as well. Andrews Race Cars can guillotine 6 foot (1830mm) long sheets up to 3mm thick in 4130N and mild steel. Our folder takes the same size sheet and is able to fold thicknesses up to 1/16" (1.6mm) using a blade, and up to 3/32" (2.5mm) using radius tooling. We can also fold heavier sheeting in short lengths in a special attachment and 'V' block in our hydraulic press. Andrews Race Cars can swage up to 1/16" (1/6mm) sheeting. Our swaging tool has a 24" (610mm) throat to handle the largest panel in a race car. We can offer either bead rolls or drop swaging for that professional finish. Andrews Race Cars can handle small machining jobs in our vertical mill or lathe. Call for details. Andrews Race Cars have welding equipment to handle most jobs. We have both 150 amp and 250 amp TIG welding machines to handle either chrome moly, steel or aluminium. Our 150 amp MIG welder is used for mild steel to a capacity of 4mm.